J-League Soccer V-Shoot (JリーグサッカーVシュート, lit. 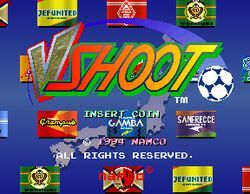 J-Rīgu Sakkā V-Shūto), commonly referred to as just V-Shoot, is a soccer arcade game which was released by Namco in 1994 only in Japan; it runs on that company's NB-1 hardware, and features the twelve then-current real-life teams from the J-League (the Kashima Antlers, J.E.F United, Mitsubishi Urawa Red Diamonds, Verdy Yomiuri, the Yokohama Marinos, the Yokohama A.S Flügels, Shonan Bellmare, Shimizu S-Pulse, Júbilo Iwata, Nagoya Grampus Eight, Gamba Osaka, and Sanfrecce Hiroshima). All the players' names also reflect the 1993 lineups - and a sequel, J-League Soccer Prime Goal EX, was released in 1996. This page was last edited on 16 September 2015, at 17:00.